Distinct employee entries in the datasheet view. Currently there is as many records for the same employee as that employee has authorized locations, recorded in a multi-valued field. Is there some way to adjust this query to get it to give back only one record per employee without having to remove the [ScanCodeLocations] field? I need that field in the form and I need it to update with the rest of the fields when the user selects a different employee record. The split-view datasheet is a list of all the employees in the production environment and the form is meant for managers to be able to modify the properties for the employees. I sure don't want John Doe listed many times. SOLVED! I created another similar form that used a multi-value field And it didn't multiply entries so I compared the two and realized what was wrong. I had [Employees.ScanCodeLocations.Value] LEFT JOINed to the [Locations] table. Employees.ScanCodeLocations.Value only stores a Location ID so the join was supposed to let me use the name of the location but that was unnecessary. 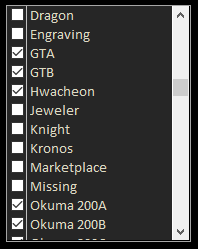 The List Box object allows me to define a row source that links the Location ID to its name so I didn't need the location name in the form's Record Source. 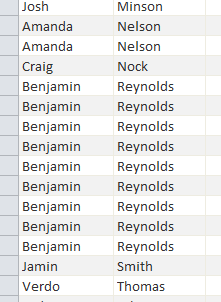 Once I removed the LEFT JOIN between Employees.ScanCodeLocations.Value and the [Locations] table it only listed each employee once. Yay!